This page documents features not yet available for general use. 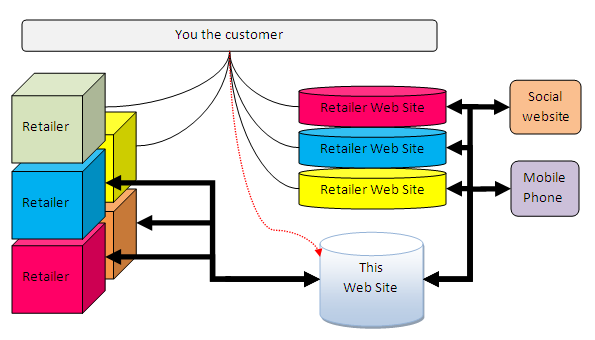 cLink provides retailers an interface to customers (hence cLink), both existing and unknown by allowing two way data communication between your backend retail POS systems and internet connected customers. Using the provided "cookie cutter" web pages for rapid deployment. With external web servers providing the main host and using retailmax for data supply to that web server, or direct to consumers. Data-Level API Base storage of data, such as stores and products. REST based API available to read and update. You can chose a single layout that provides the overall page layout, such as vertical or horizontal menu, title positioning and other overall general appearance options. There are a small number of layouts for you to chose from. You can chose from a variety of styles (CSS styles) to control options such as font selection and size, colors and other appearance options. Not all styles work well together or with every layout, but you are free to try and use any combination. You can provide your own style sheet files if you wish. Widgets control what is actually displayed on the screen, they take your data and present it to the user. Different widgets can be selected to control your preference of how you might want the data presented. For example, a "product grid widget" might display a grid of products you sell - the layout (above) defines where the information might appear on the screen, and the style (above) controls how it appears, the widget controls what is actually shown and how it interacts with the user.